and Christian TV and to make use of our handy online program guide. The Best Quality, Lowest Installation Price & Biggest Bonuses for Christian Satellite TV. Be served by the Christian TV people. Don’t miss out on the experience. Instal-Life is committed to ensure every household can afford to have Christian TV. We know that once you have Christian TV you will wonder how you lived without it. Christian satellite TV will provide you with 12 free-to-air Christian channels with lots of depth and variety including - faith-filled television, conferences, Bible teaching, kid's shows, teen programs, documentaries, movies and more. We have a heart to see every home, everywhere, with access to Christian TV because we care about what you watch. 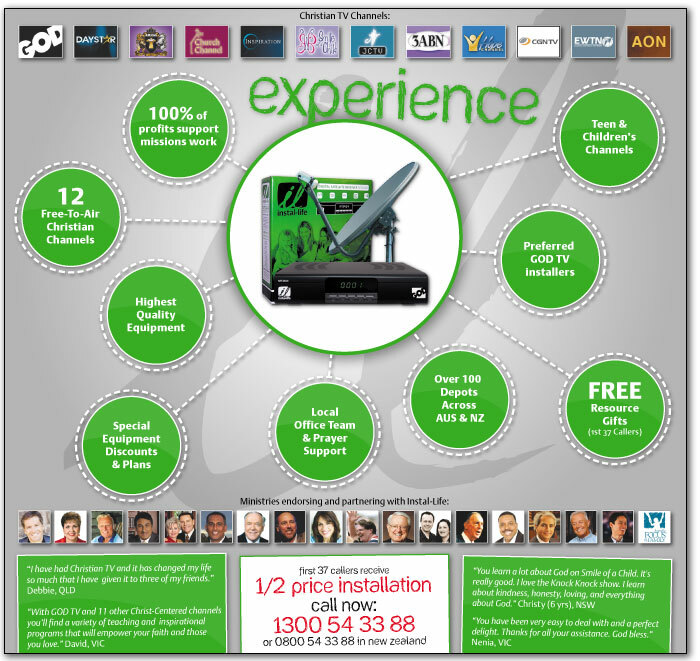 Call Instal-Life today on 1300 LIFE TV (1300 5433 88) in Australia or 0800 LIFE TV (0800 5433 88) in New Zealand. Installing Christian TV is simple with Instal-Life where we value excellence in all areas of our business. The team at Instal-life trusts that after reading these 7 points of difference that you will have the confidence to choose us to serve you. Please feel free to call us now on 1300 5433 88 (AUS) or 0800 5433 88 (NZ) to TRY Christian TV and get your bonus pack today. Instal-Life is GOD TV's preferred national installation company. Instal-Life is GOD TV's preferred national installation company. GOD TV covers more global conferences than anyone else offering exceptional programming content and variety. Instal-Life is very honoured to work in conjunction with GOD TV here in Australia.